I haven't linked up or showed much progress on two of my three (3!! -- how did that happen? Well, it did...) RSC2017 projects with Angela at so scrappy. I think it's time. My original project. 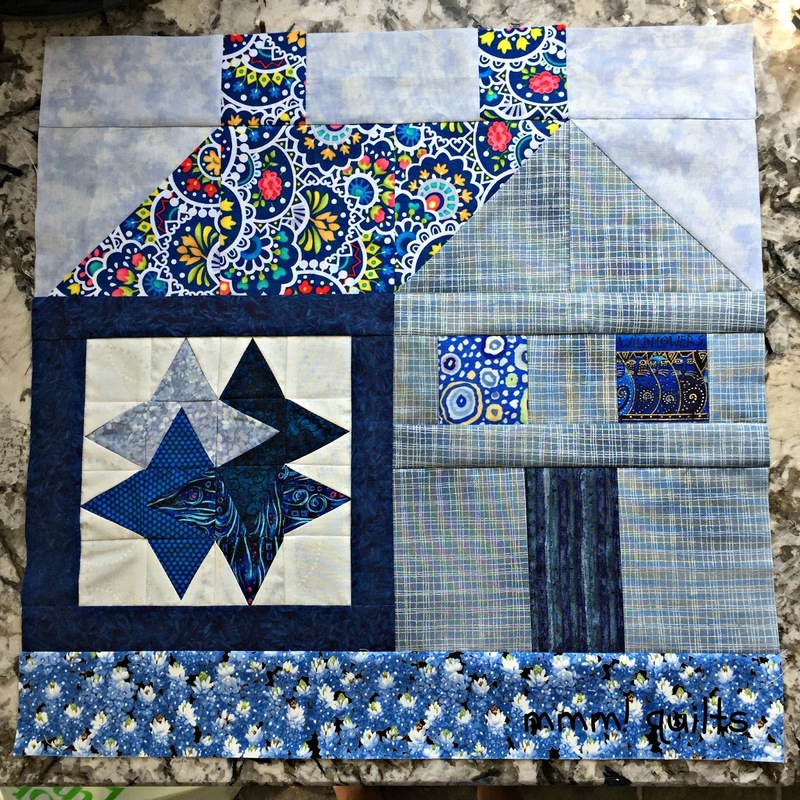 My house quilt! 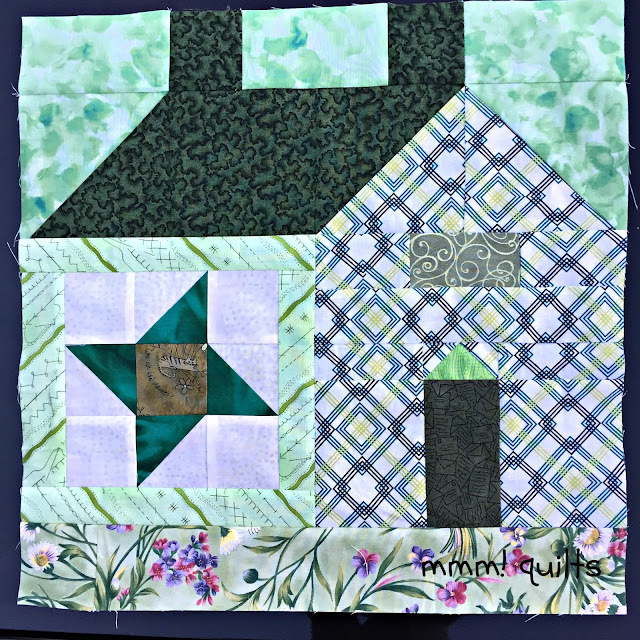 I drafted a basic schoolhouse block combining several ideas: the one on the cover of my first quilt book I ever bought, The Quilter's Companion from That Patchwork Place, a paper-piecing pattern I have by Denise McKenna from many years ago (15?) 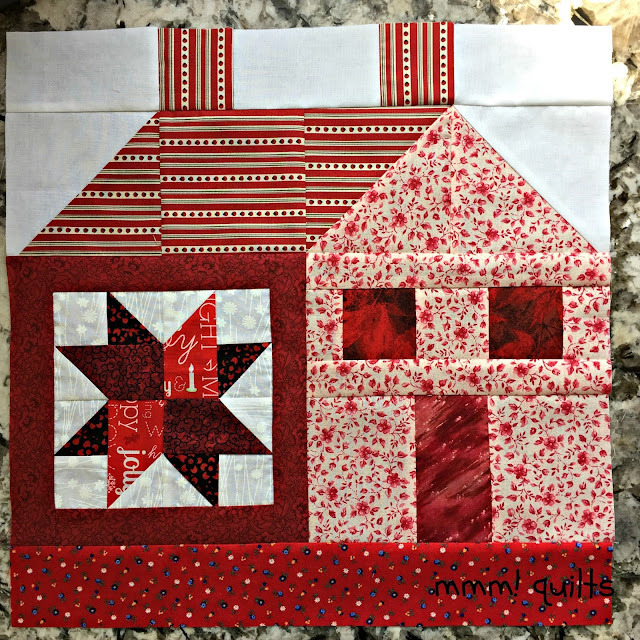 that has a quilt block on the side of each house, and Lori Holt's barn blocks on Pinterest. I made the first block in January's colour, purple, made the second one in turquoise leftovers, and felt compelled to turn it into a cushion cover for my new sewing loft space. I had had no idea aqua would be the February colour! So I thought I'd make another in aqua for the quilt, but that hasn't happened. Nor had any other colours, much to my embarrassment. Until this week. March - red. See the candle in the 'window'?! When the owl flew into my purple house little block, I knew I'd be doing something in every house block. A really good quilter would have aligned the stripes in the roof...I'm pleased I got the stripes in the HSTs running in the right direction! Have I mentioned how much I adore scrap quilts? Here the yard is a red flower-filled cotton print from Cranston Printworks bought 29 years ago when I learned to smock, and made my girls matching smocked dresses. (need to dig up a photo of them wearing them) The roof stripe is a scrap from my first published pattern on Moda Bakeshop, and the windows are scraps of Paintbrush Studio's Windfall, which I used for the quilt that inspired the first QAL I ran here on the blog. April was multi-coloured fabric, and I haven't decided whether I will make a multi-coloured house yet. Will wait until the end and see how many blocks I have, and how they play together. May - green. The yard is fabric from my mum's favourite bag I made her that literally fell apart after so much use--love that! The roof scraps from my dear friend John's quilt, Shamrock, the house front leftover backing from Callum's quilt, Shift. I played around again with a slightly different look to the house front. I'm sure you spotted the cat in the 'window'. I am tickled that I found the green, kind of cloud-like fabric, used in Cheryl's Meadow Mystery for the sky. Love the letters fabric for the front door! June- yellow. Didn't put anything special in this block, so I'll have to quilt in something. I like the fact that on the little star block a scrap of new fabric, Masterpiece Mixers by Kanvas Studio from my Coins of the Atocha quilt, is used to frame an older batik, bought in NYC, I believe, and scraps of Moda fabric for lining for an Amy Butler bag, bought in Eugene, Oregon! July - blue. The blue is scraps of Nancy Halvorsen's 'Bree' fabric that I used for my latest, not-yet-released pattern in Benartex's next edition of their e-zine, more Bree scraps are in one of the little over-lapping stars, which has old, but terrific fabrics on the other three sides of it. Cats in the one window, Laurel Burch fabric so generously given to me by my dear friend Jake, and Kaffe scraps in the other from Harbinger of Spring. August is neutral colours, and I have a block started. If you're curious about the little star blocks (6") on the house side, the red, blue and yellow ones are from the 150 Canadian Women QAL, and the others I've drafted from traditional blocks. A different star is in each house side. Gives a new meaning to flying geese, right?! My strings quilt, the project that just kind of happened. It's a leader/ender project using strings, which now also appear to be having babies and multiplying out the yin/yang. In case you don't recall, or didn't bookmark the link the previous times I have shown it, the tutorial is here. She did hers all multi-colour, whereas I had the idea to do opposing corners in scraps of the same colour. I had no plan other than that, just to see what would happen. It's taken a few months to realize I need a little bit of a plan, well a strategy anyhow. So I now don't do both opposing corners in a colour unless I know where the block is destined to fit. It's starting to take shape! I did add neutral to this project: I had the idea to do the four corners in neutrals, so I have one done here, the top left. 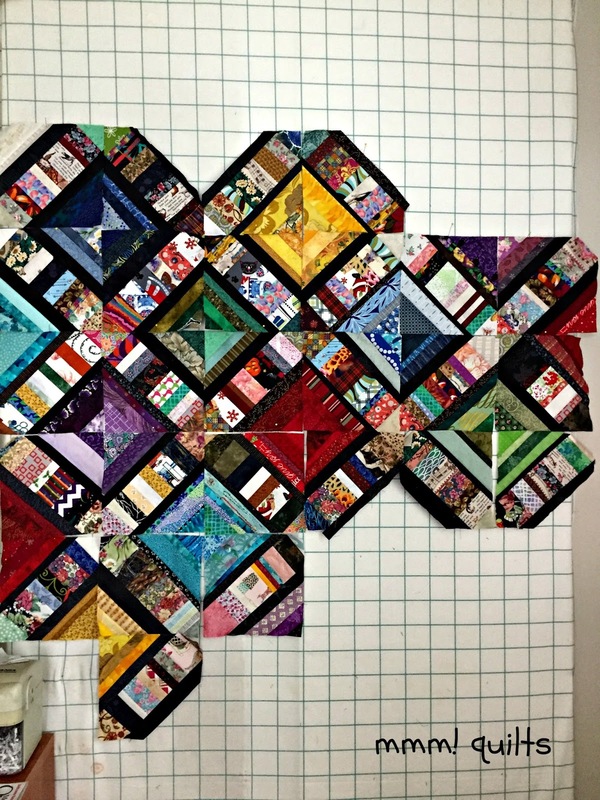 I envision this quilt to be 6X8 blocks, so it will finish around 48X64 since these are 8" finished blocks. Linking up with soscrappy where there is a ton of inspiration for rainbow scrap projects! 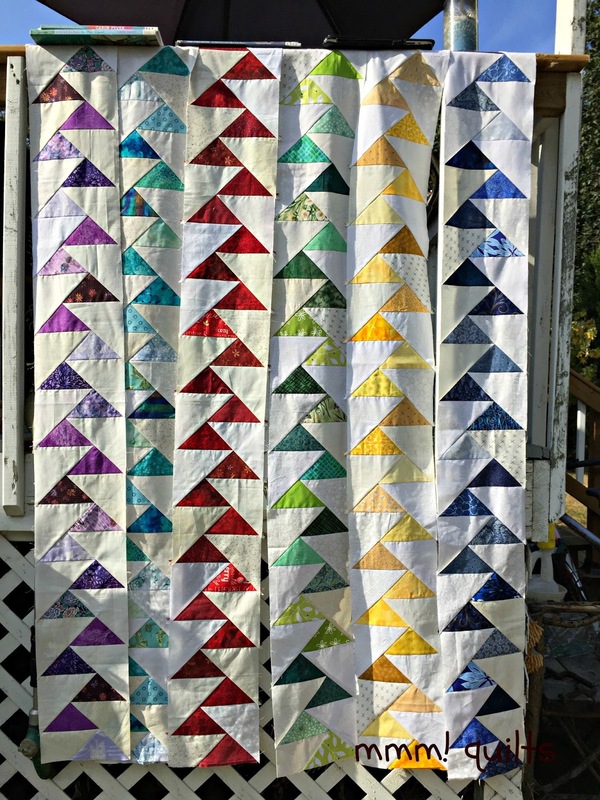 Oh, you goodness, between these projects, your Canadian Women quilt blocks, and those gorgeous house blocks in your most recent post, you've been one busy woman! I admire that you are able to keep up, month to month, week to week. I started a BOM last spring and got all the way to the ninth block and no further. the string blocks look great and I love your houses Sandra. One of these days I plan to do some too, but who knows when I will find the time! How nice to have your houses full of memories. You mother's flower garden is delightful. Surprises in every house. The string blocks are such a great interlocking design. Keep up the good work! Great blocks, I like all of the different colored houses. I really like everything that you have done; but I really love your migrating geese, they are so pretty! Love, love, LOVE how all your RSC projects are coming along!! Let's see house blocks, migrating geese, string blocks..where do you find the time? Love em all!!! All your projects are looking great. Love those geese. 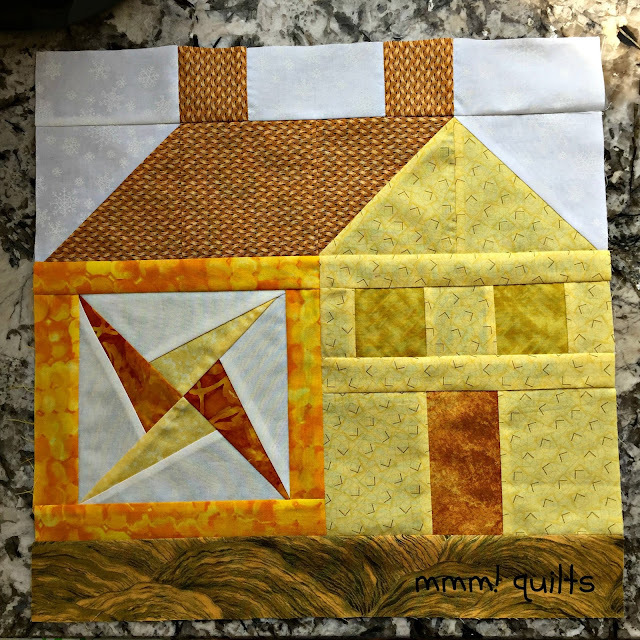 I am just in love with those migrating geese AND the string quilt! Both are coming along nicely. :) The house quilt is going to have quite a story with it. I love saying "this fabric was from when...". 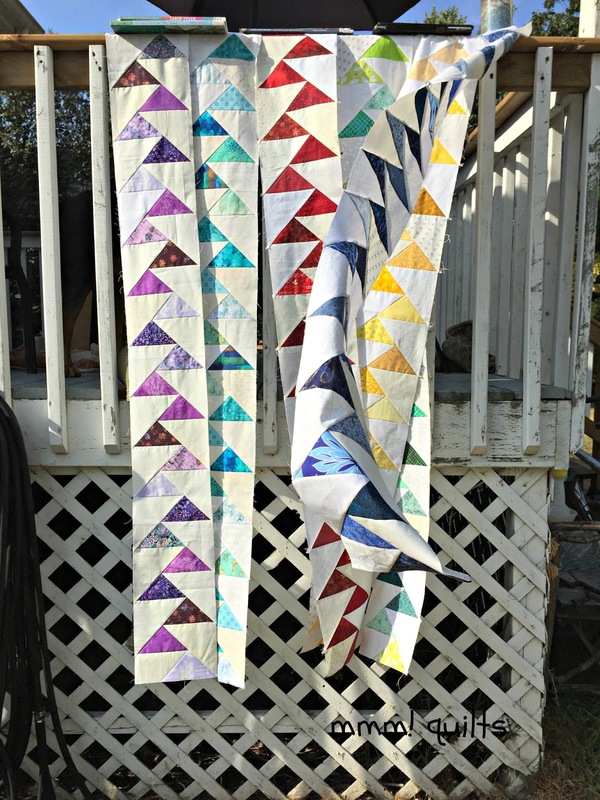 Those are my favorite parts of scrap quilts. Love your house blocks. That's another project on my RSC list. You have some gorgeous scrappy projects in the works. All very beautiful and colour-filled!